I suppose there is a strange unifying factor about the local tavern or your favorite watering hole, where everyone gets together to celebrate one another’s triumphs as well as sadness. If your favorite sports team wins, then you drink to celebrate, but if they let their fans down and endure another year of disappointment, then it is all the same – one would drown his sorrows in the nectar of the gods as well. Having said that, having the right kind of drinking utensils and equipment would go a long way in enjoying your drink, and there is nothing quite like the feeling of ice cold beer sloshing down your throat. 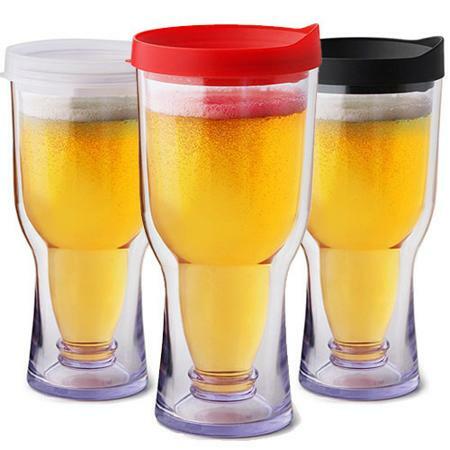 The thing is, your bar might run out of a chilled beer mug that changes the experience somewhat, which is why you can opt to settle for the £16.99 Brew2Go Non-Spill Portable Beer Glass that comes in black, clear and red options. The Brew2Go Non-Spill Portable Beer Glass allows you to ensure that your beer remains nice and cold even as you move around and about the place, and as its name implies, it will ensure that unwanted bugs (as well as other impurities, such as someone drunk who might mistake your normal mug for an ashtray) will remain out of bounds, all the while ensuring that you get to savor your drink right down to the very last drop. The Brew2Go can also be said to be an environmentally friendly way to consume your beer without having to settle for throwaway cups that add to our landfill. It comes in a double-wall insulation configuration, ensuring that your drinks remain nice and cool despite being in your sweaty hand, and it is made out of robust, BPA-free, SAN acrylic, making it ideal to bring with you wherever you are. Definitely the first choice festival drinking glass for regular drinkers, no?